Holbeach United will meet Peterborough Sports in the ChromaSport & Trophies United Counties League Cup final after beating Wisbech 2-0 in the semi-finals last night (March 23). The Tigers scored goals towards the end of each half to see off the Fenmen in the Carters Park derby. Wisbech shaded a first half of few clear-cut chances but found themselves trailing at the break, Josh Ford converting a 43rd minute penalty he had won himself. Luke Wilson’s goal-line clearance from Jordan Thomas early in the second half kept Wisbech in the game. Holbeach sealed victory with a well taken Sean Coughlan goal three minutes from time. It was the perfect semi-final performance from Tom Roberts’ side, who progress to their first final since lifting the trophy back in 1990. The final will take place at Deeping Rangers’ Haydon Whitham Stadium on Monday, May 2 (3pm). 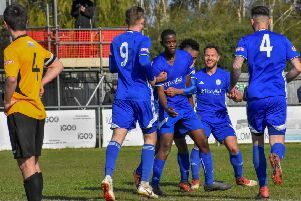 Meanwhile, it was another away game to forget for Spalding as their play-off hopes took another hefty hit in Division One South of the Evo-Stik League. The Tulips had two players sent off as they drew 0-0 at Carlton Town. Skipper Nathan Stainfield and striker James Tricks both saw red for Marcus Ebdon’s side, who stay 11th. They are now eight points off the play-offs, but have now played a game more than Lincoln United, who are fifth.